This warm hearty vegetable soup is really comforting during cold winter days or even for very cold condition during the summer such as here in Montreal. This recipe is very simple to make and all you need to do is to add ingredients into the pot. This is more than your regular vegetable soup (or canned soup), adding garlic tomato paste gives a kink to the soup. 1. Remove tomato seeds with fingers and then, cube. Slice zucchinis, celery, carrot, and chop onion. 2. 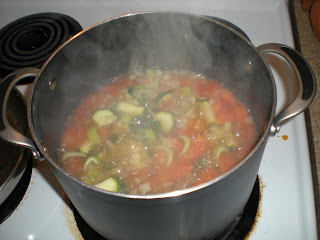 In a large pot, boil vegetable stock over medium-high heat. Meanwhile, in a skillet, cook onions until brown. 3. 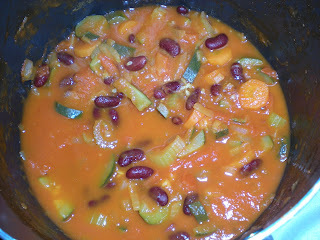 Add cooked onions, tomatoes, zucchinis, carrot, celery to the pot. Cover and bring it to a boil for 10 mins. Add kidney beans to the pot. 4. Meanwhile, prepare garlic tomato paste. In a blender or food processor, add whole cloves of garlic and tomato paste. Since paste is thick, add a little bit of water (2-3 oz.) just enough to start blending, you might need to shake it up to make it run. Gradually add olive oil and then, salt. The paste is ready once the garlic are "invisible". 5. Mix in paste to the soup and bring it to a simmer. Leave it for about 5 minutes. Taste, and add salt and pepper if necessary.